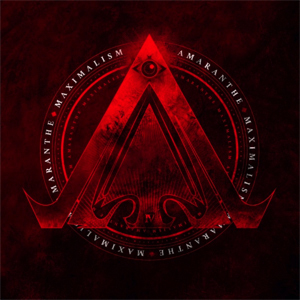 AMARANTHE, the cutting edge outfit with the triple lead vocal attack, can now reveal the title, artwork, and release date for their latest studio album. Titled Maximalism and due out via Spinefarm Records on October 21, the album is a hyper-modern, metallic beast. It's the band's fourth record since first joining forces back in 2008; produced once again by Jacob Hansen (VOLBEAT, EPICA, DELAIN) and mastered by Svante Forsback (RAMMSTEIN, APOCALYPTICA, DRAGONFORCE), it sees the Swedish/Danish sextet delivering 12 new tracks that fully live up to the "bigger, bolder" promise of the title. "Maximalism is our manifesto to the world," said lead guitarist Olof Morck. "We are genuinely thrilled with the new material, definitely our most diverse collection to date; our trademark 'bleeding edge' modern metal remains intact, of course, but fused with an even broader range of genres than before. There's everything here including stadium rock, innovative pop and danceable super-hits. Expect these tunes to enter your mind on a permanent basis!" U.S. tour dates are forthcoming. So stay tuned.